What kind of Binding Supplies are there? Q: What kind of Binding Supplies are there? A: Binding supplies is an incredibly general term that applies to any kind of binding spine or piece that will hold together pages, creating a bound document or book. 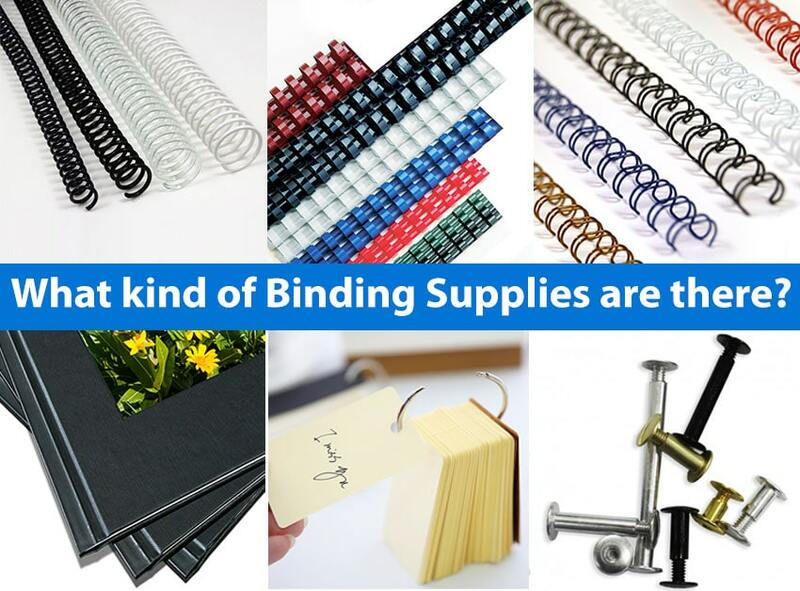 There are literally hundreds of different kinds of binding supplies, and therefore hundreds of different ways to bind documents. In this article, I will go over the most popular way to bind books, which include plastic coils, binding combs, wire bindings, ring binders, thermal covers, and more. If you have any questions along the way, please don't hesitate to call our binding supply experts at (866)537-2244 (866)537-2244 . • Wire Binding Supplies - One of the most popular ways to bind documents for businesses and recreational use (like journals) is with wire binding supplies. Also called twin loop and double-o wires, these pretty wire bindings will hold your pages together with a traditional punch-and-bind method where you punch holes in your page in a specified punching pattern and size/shape (3:1 or 2:1 pitch, and round or square holes using a wire-o binding machine), place the wire through those holes, and then use a wire closing machine to finish the bind. Professional and classic, wire binding is a smart choice for businesses who want to present themselves as professional and modern. • Plastic Spiral Binding Supplies - Spiral binding supplies are another top-seller in the binding supply market. They are a spiraled coil (as if you couldn't guess from the name) and made of a flexible plastic material that offers it a unique strength and durability, while still allowing it to retain it's original shape. Coils are most often used for internal reports and presentations, as they can look a bit "cheap" to some people (although I love them). • Plastic Binding Comb Supplies - Probably better known as GBC combs. plastic binding combs are the best way to bind inexpensive documents or very thick presentations. Engineering firms in particular use the plastic comb binders as a way to create proposals and presentations for large projects. GBC comb bindings are incredibly cheap to buy, come in a lot of colors, and can be custom printed on with our specialty equipment for a great way to brand your businesses. A major bonus with a plastic comb binding is that they are easy to open up and fix any page mistakes you may find (you can't do this with wire binding or coil binding). • Ring Binders - Every person from every walk of life has likely encountered ring binders in their educational or businesses experience. It is the most efficient, quick, and easy way to bind loose pages together of any kind. Most often they will be letter size (8.5" x 11") with 3-rings, but you can also find mini ring binders (half size 3-ring binders and memo size 6-ring binders) as well as legal (8.5" x 14"), and even tabloid (11" x 17" binders. Plus, binders can be paired with any number of index tab dividers to make organizing the contents easier. • Binding Rings - Book binding rings are kind of like a deconstructed ring binder; they are just loose rings that easily open and close, but are not attached to any spine or cover. This makes them more versatile, as they can not only be used to bind paper, but also for more mobile fabric swatches and textiles, in any number of crafts, to organize household items, and so much more. Binding rings are incredibly fun to use, are very inexpensive, and can be opened/closed as many times as you need, so there is no limit to the number of edits you can make to your bound materials. • Binding Posts - Also called screw posts or Chicago screws, binding posts are another fast way to bind loose pages. They fit into standard punched holes (such as those produced by a desktop hole puncher) and because they are not attached to a spine of any kind, you can use as few or as many as you want to bind your pages. Binder posts are most common in a hard metal aluminum, but extra sturdy steel Chicago screws, as well as plastic screw posts, are also an option. The versatility sets binding posts apart from many other binding supply types on the markets. • Thermal Binding Covers - An incredibly professional way for your businesses to bind presentations, thermal binding is pushing punch-and-bind to the wayside and paving the way for a simpler, more efficient, and more attractive way to bind books. There is no hassle or time needed to punch; all you need is a special thermal (heat) binding machine and some pre-made covers to make the classiest presentations, quicker than ever before. Plus, the huge variety of thermal binding covers (thermal binding supplies) available means you can make soft cover books, hard cover books (like yearbooks), and even custom printed covers, all from the comfort of your office and with no special equipment other than your single-piece thermal binding machine. • Tape Binding Strips - Tape binding, also called strip or stripe binding, is another popular binding supply option. They are clean, fast, and convenient, offering a fast bind without any hassle with punching. With the Fastback line of tape binding machines and tape binding strips, you can make books in just 90 seconds. Basically you place your pages into the machine, the machine then tells you what size strip to use, and then you insert that strip. The machine will bind the strip to your book block. You then move it to a cooling rack, and you're done! It is very fast, unobtrusive to your front binding cover, and creates a flat bind that is ideal for transport and storage. • Velo Binding Supplies - Velo binding is also commonly called legal binding or strip binding. The process actually involves melting two binding trips together, which makes a very permanent bind (hence why it is so popular for the law industries). It is tamper-proof, and can only be unbound with a special tool. Sometimes there are cold melt "velo" bindings, however, the "hot melt" is far more popular and secure. • Spine Stapling - Also called saddle stitching by the larger market users, spine stapling uses a unique "saddle" stapler or a special stitching machine to put staples (or small metal wires that are folded in on themselves) into a folded spine of your book. Most often used for booklets, pamphlets, directories, magazines, catalogs, and other simple books where you don't want a binding spine to impede on the integrity of the binding covers. • Perfect Binding Supplies - Perfect binding is the professional industry term for a soft cover book, such as novels. It is a process that uses a machine to add texture to a book block, apply a specialized binding glue, and then apply your cover to the book block. The machines are priced for industrial use, and not as much for offices, so they are ideal for higher volume book binders, such as print shops, binderies, and publishers. • Pad Binding Supplies - Pad binding is a simple way to make pads of paper, like notepads, peel-off pads, magnetic notepads, and so much more. They are easy to make with just a few notepad binding supplies, including padding adhesive, a paper clamp, and a padding brush. You can also use a padding press machine if you are doing higher volumes, but they are easily made individually as a crafting tool.